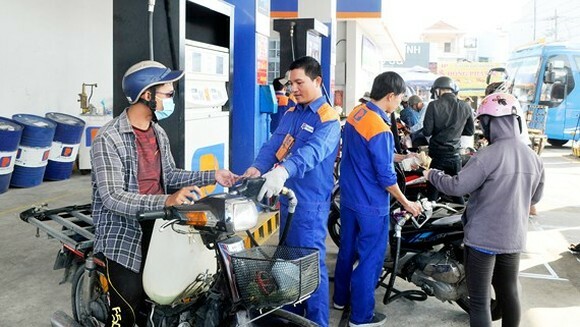 Nguyen Phu Cuong, director of the Department of Science and Technology under the Ministry of Industry and Trade told a forum held in Hanoi on Wednesday that E5 is not a new fuel. “The roadmap to replace RON 92 with E5 has been carefully prepared,” Cuong said. Cuong said the ministry in co-operation with relevant agencies and big petroleum producers collected opinions for the replacement in the 2007-12 period. Dr Pham Huu Tuyen from the University of Technology, took random vehicle models to test E5 gasoline, and said toxic components in the exhaust gas while using E5 bio-fuel were considerably reduced in comparison with RON92. Pham Anh Tuan from VAMA provided a survey of its members showing that E5 petrol did not have bad impacts on vehicles which were produced after 1997. Some, which were produced before 1997, could see some negative impacts, but not affecting quality or safety. “For vehicles sold in Vietnam, it is recommended not to use leaded petrol and methanol. E5 bio-fuel does not have an impact on the engine,” Tuan said. Sharing this opinion, Nguyen Van Phuong, from Vietnam Register, said information from vehicle producers affirmed that most current vehicles are compatible with E5 and E10 petrol. Answering a question about the surge in the price of RON 95 recently, which was rumoured to force consumers to use E5 instead of RON 95, Cuong from MoIT said the Government had not aimed to do that. The retail price of E5 biofuel is about VND2,000 (8.9 US cents) per litre cheaper than that of RON92 petrol at VND18,243. Meanwhile, the retail selling price of RON95 petrol has been increased by VND760-810 per litre to more than VND20,690. After nearly two weeks of using E5, Do Huu Tao, head of the Technical Department of Vietnam Petroleum Group (Petrolimex) said it was estimated that 65 per cent of consumers were changing from RON 92 to E5 and this was increasing. Nguyen Van Khoi, from the Directorate for Standards, Metrology and Quality said there were no reports of vehicles damaged by using E5 fuel. E5 fuel is a mix of A92 petrol (95 percent) and biofuel ethanol (5 percent). The ministry sent a report to the deputy Prime Minister Vuong Dinh Hue, who is also head of the price management board of RON 95. This was the reason that the two ministries used RON 92 for the calculation of basis price in the local market, the ministry said, adding that it would report to the Government on the announcement of the RON 95 basis price when the number of vehicles using the fuel increased.